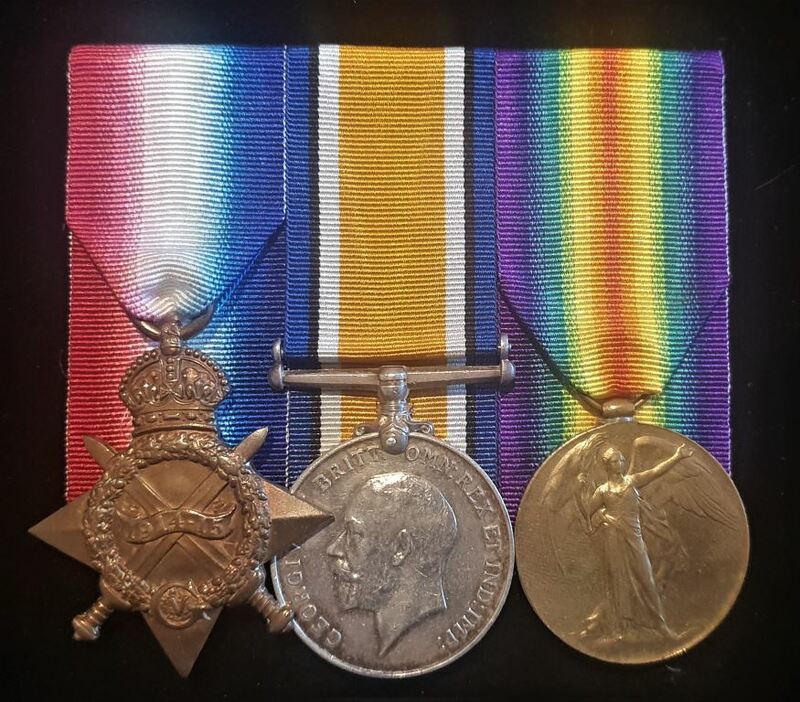 CPL Ellis embarked on the 22nd October 1914 from Adelaide with the 3rd Light Horse Regiment AIF. 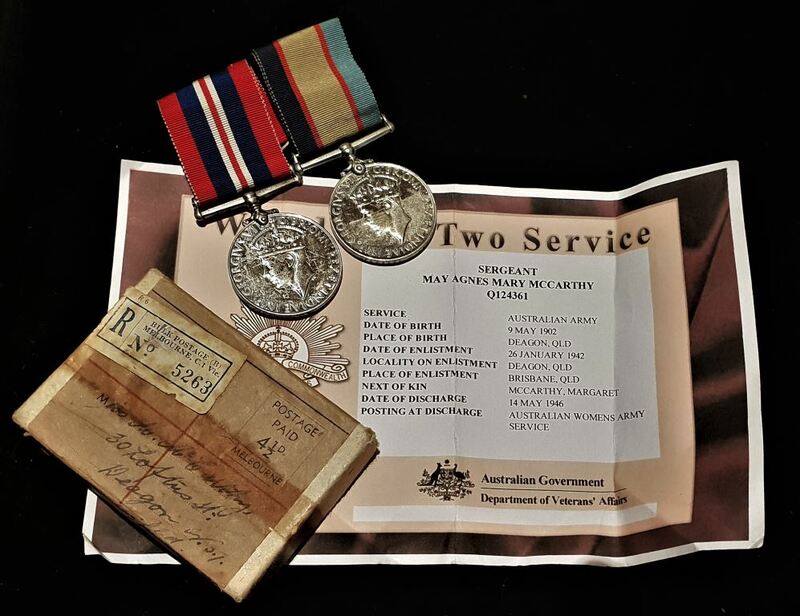 Returned to Australia on the 15th November 1918 due to being an original 1914 enlistee. An impressive service of 4 years and 189 days. 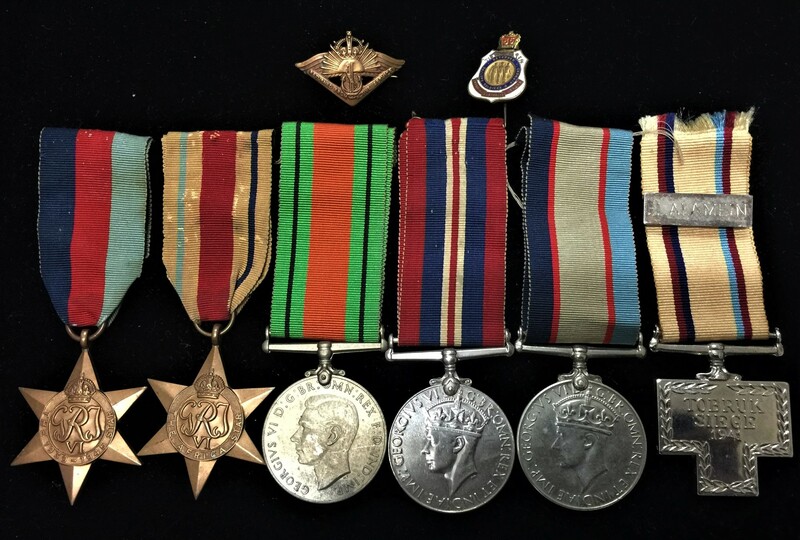 Four: British War, Victory, War Medal 1939/45 and Australian Service Medal 1939/45. 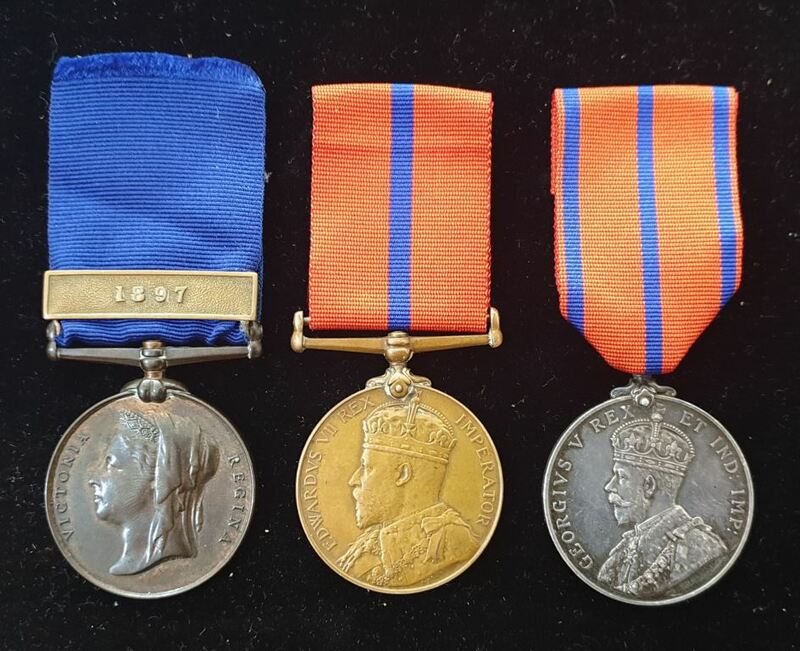 WW1 medals impressed to 5080 PTE. W. T. DOHERTY 48 BN AIF. 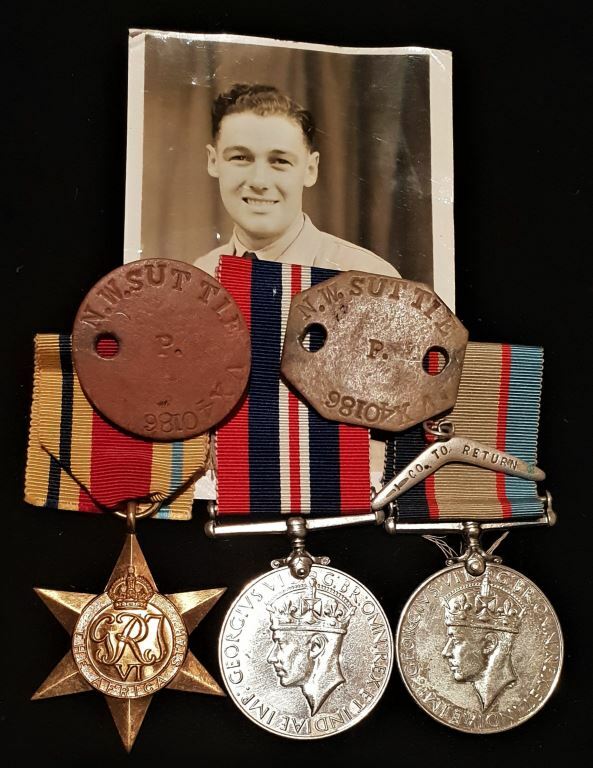 WW2 medals impressed W13148 W. T. DOHERTY. 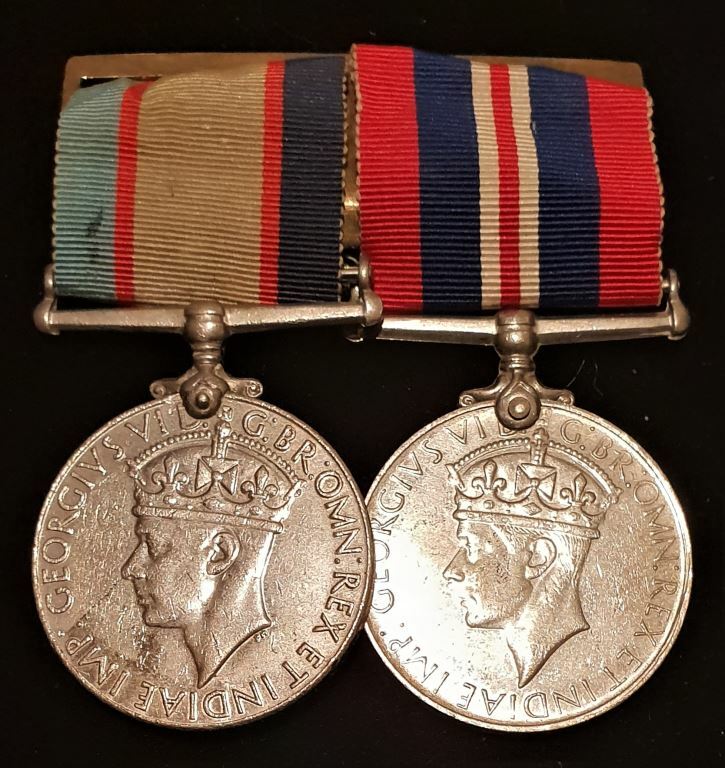 Charged with leaving a post without orders and originally sentenced to 10 years and commuted to 2 years on the 10th September 1916. 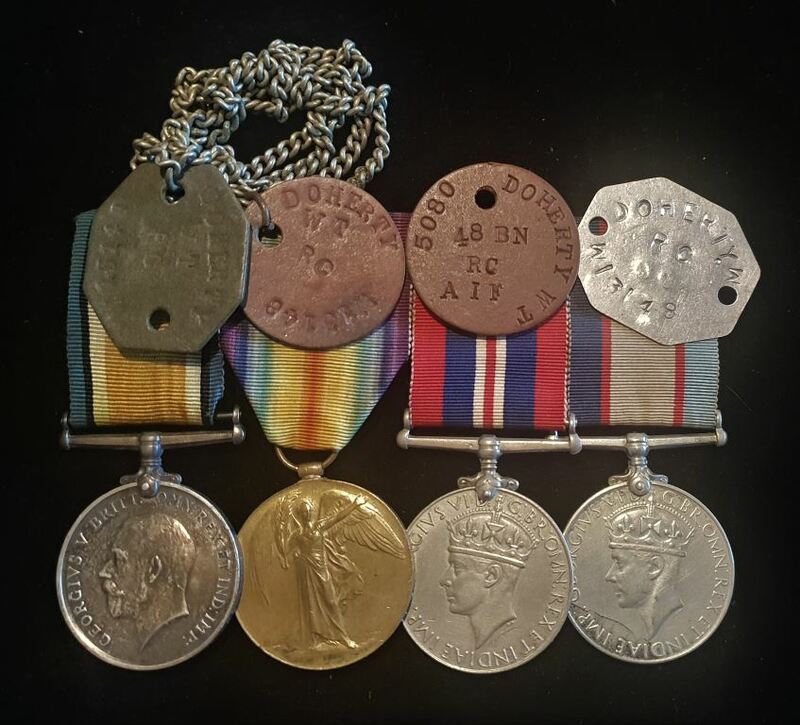 Sentence was suspended on the 27th November 1917 by letter of remission and Private Doherty was returned to his unit from Military Prison. Note: Comes with WW1 & WW2 dog tags named to recipient. 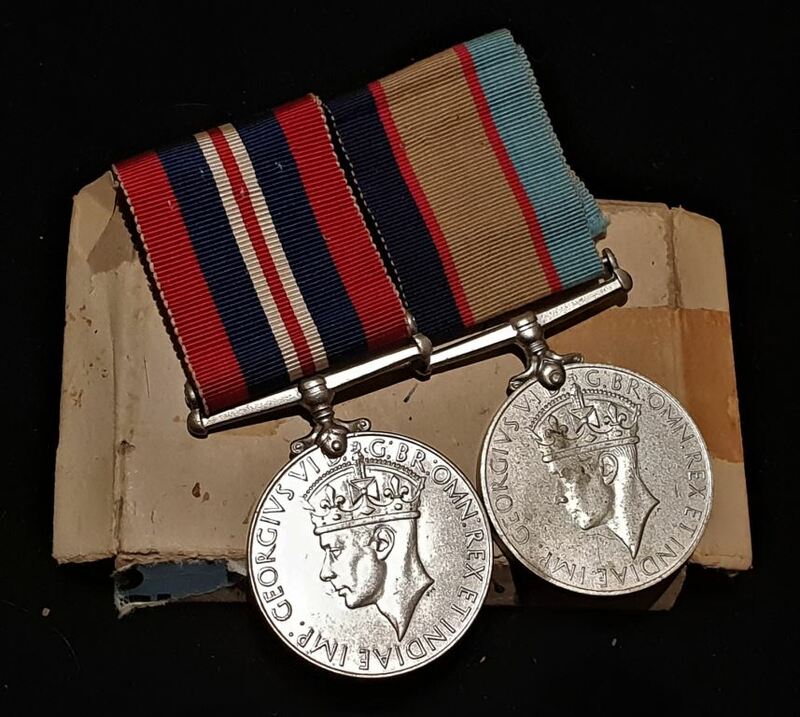 PAIR: British War and Victory Medal, both correctly impressed to 12602 PTE P. CARROLL 11- F. AMB. A.I.F. Buried at Bagneux British Cemetery, Gezaincourt, Somme, France. Memorial Plaque: Correct one piece cast named to FRANK GREEN. 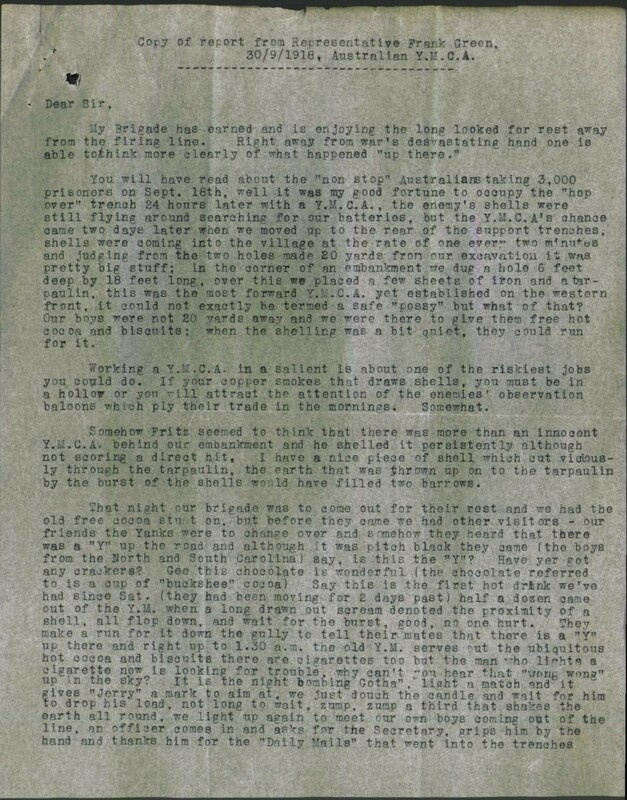 Frank Green embarked in August 1916 from Melbourne as the Australian YMCA Representative (attached 3rd Infantry Brigade). Memorial Plaque: Correct one piece cast named to WILLIAM CUNNINGHAM QUINN. 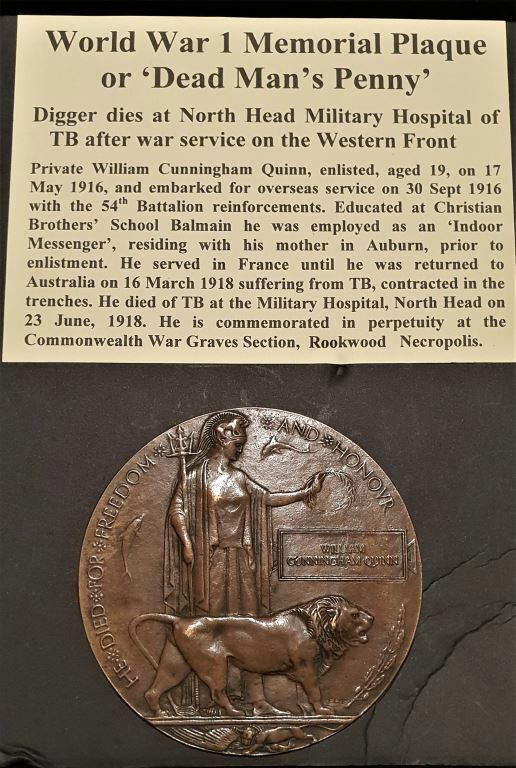 Note: Rare to have a death plaque to a soldier who died on Australian soil. Memorial Plaque: Correct one piece cast named to ARTHUR PERCY MARTIN. 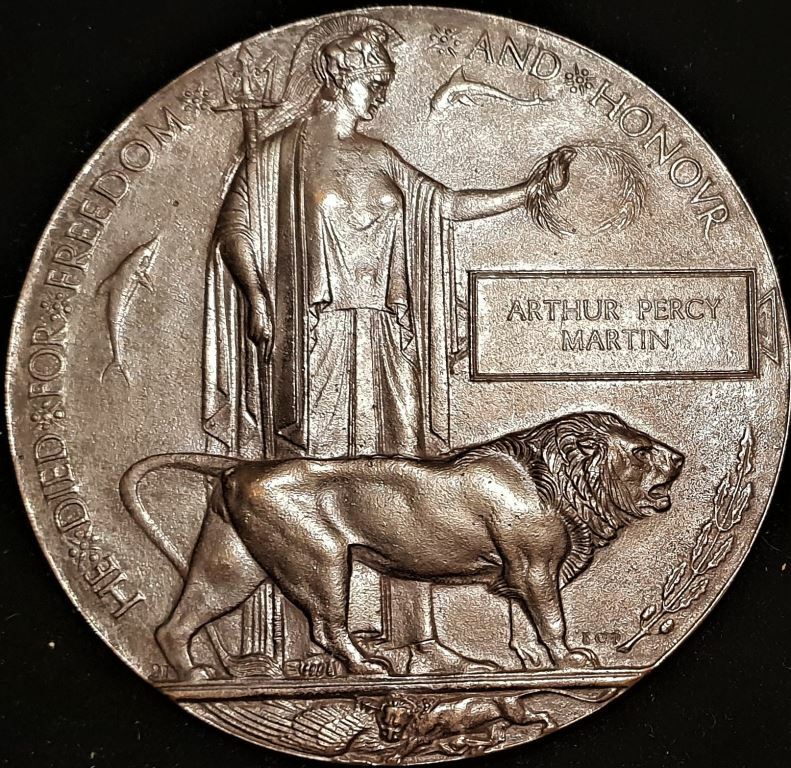 135 PTE Arthur Percy Martin embarked on the 18th November 1915 from Adelaide with the 32nd Battalion AIF. 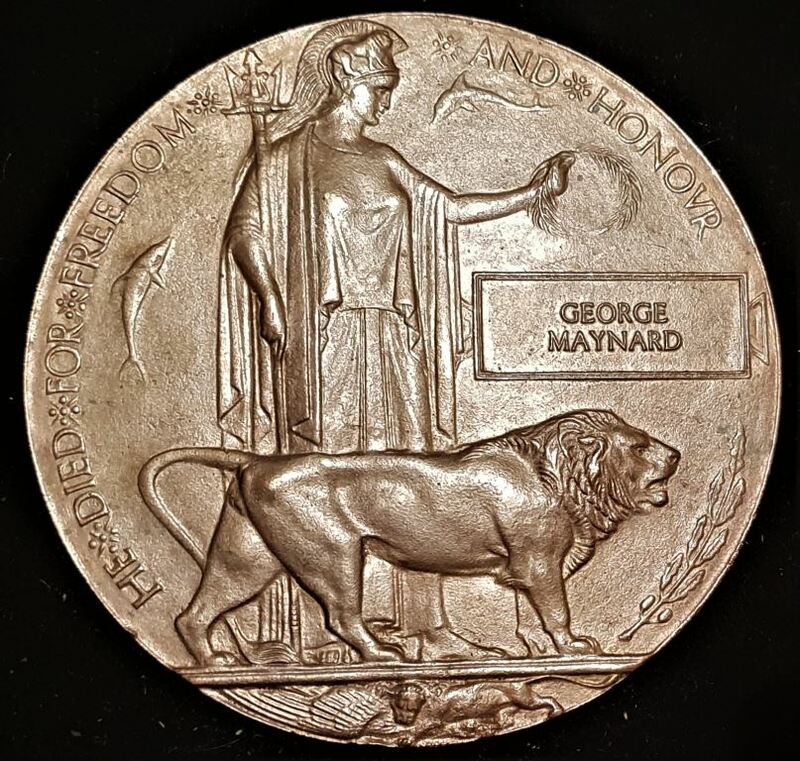 Memorial Plaque: Correct one piece cast named to GEORGE MAYNARD. 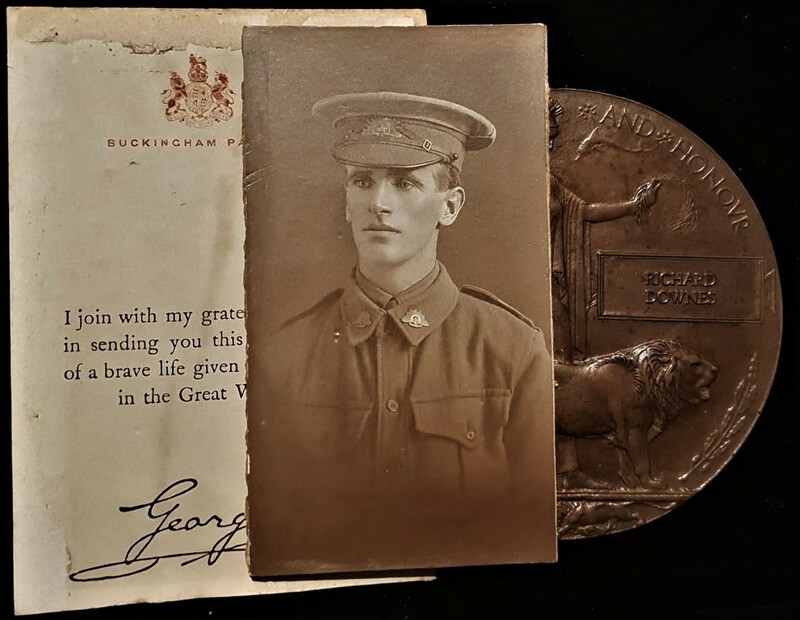 6102 PTE George Maynard embarked on the 25th October 1916 from Sydney with the 17th Battalion AIF. Memorial Plaque: Correct one piece cast named to WILLIAM RAE. 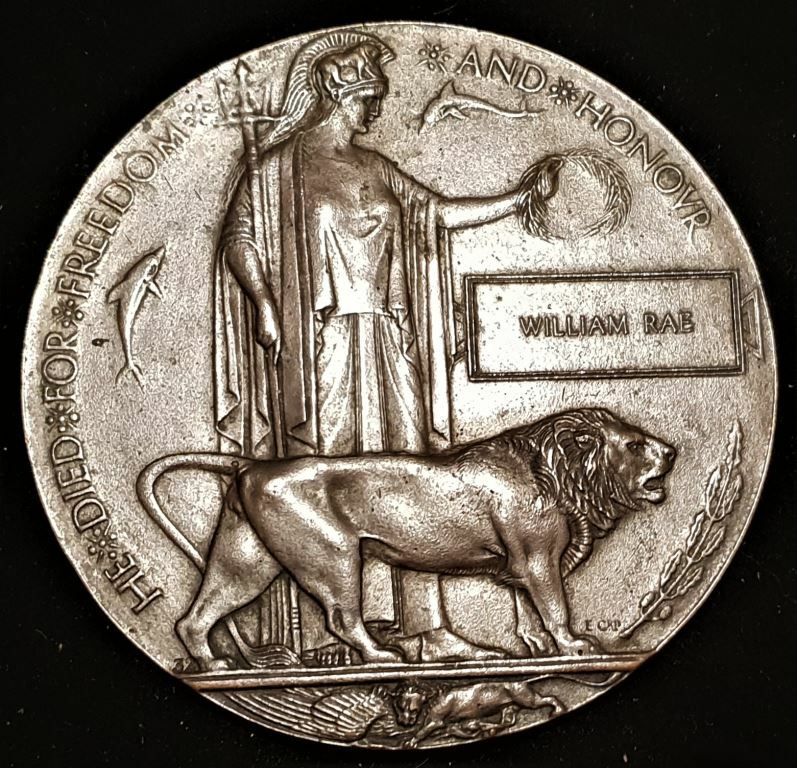 4915 PTE William Rae embarked on the 7th March 1916 from Sydney with the 5th Battalion AIF. Memorial Plaque: Correct one piece cast named to CHARLES WILLIAM WINKLER. 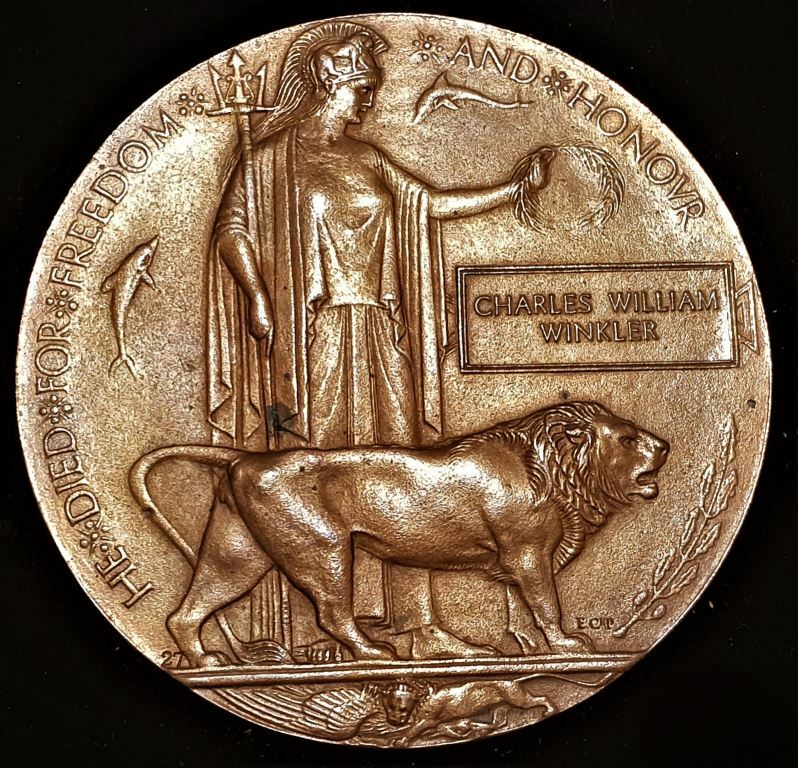 3968 Pte Charles William Winkler embarked on the 2nd December 1915 from Adelaide with the 10th Battalion AIF. 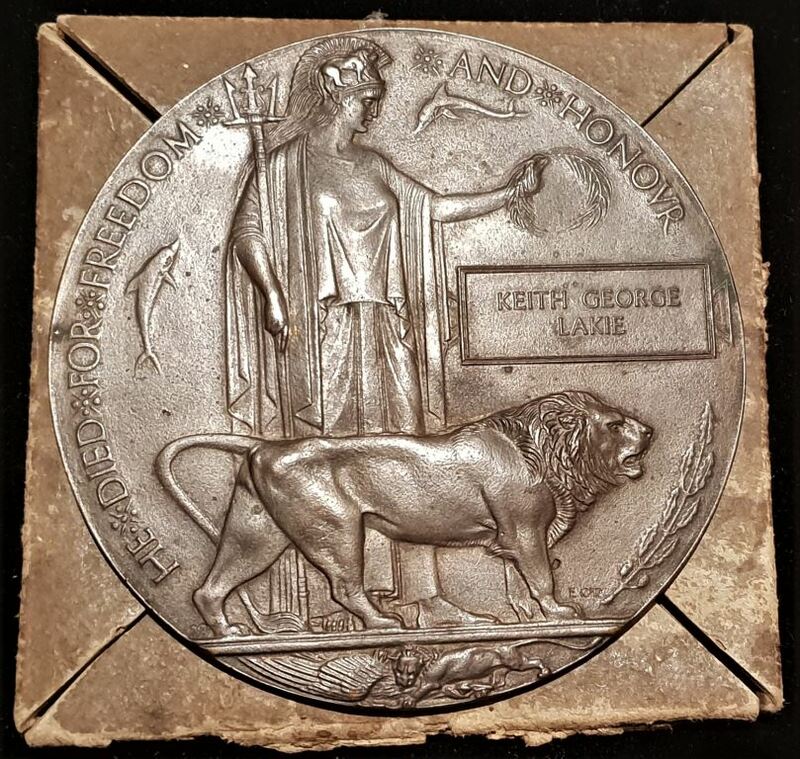 Memorial Plaque: Correct one piece cast named to KEITH GEORGE LAKIE. 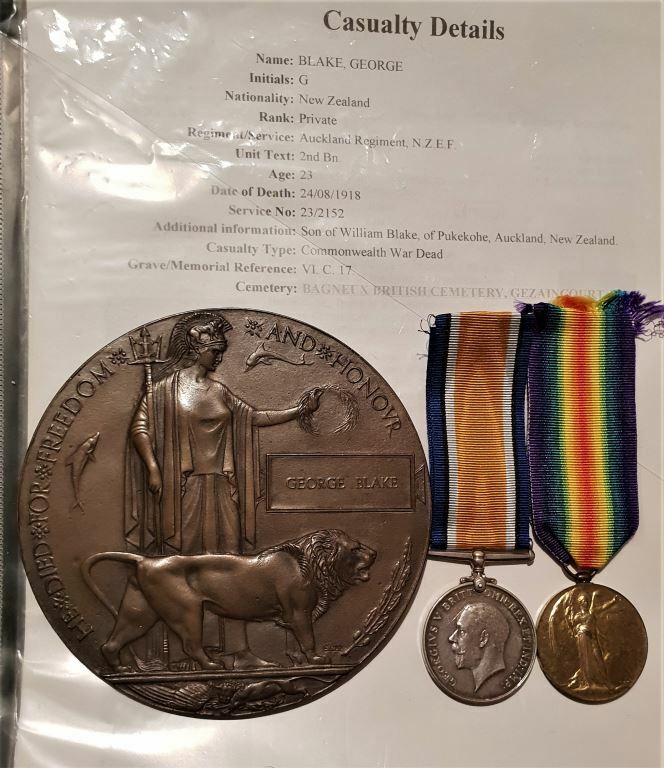 4209 Pte Keith George Lakie embarked on the 11th January 1916 from Adelaide with the 10th Battalion AIF. Red Cross accounts of Private Lakie’s death are conflicting in the exact details of his death apart from the fact that he appears to have been blown up by artillery fire at Mouquet Farm at some stage on the 14th. Memorial Plaque: Correct one piece cast named to THOMAS HARVEY. 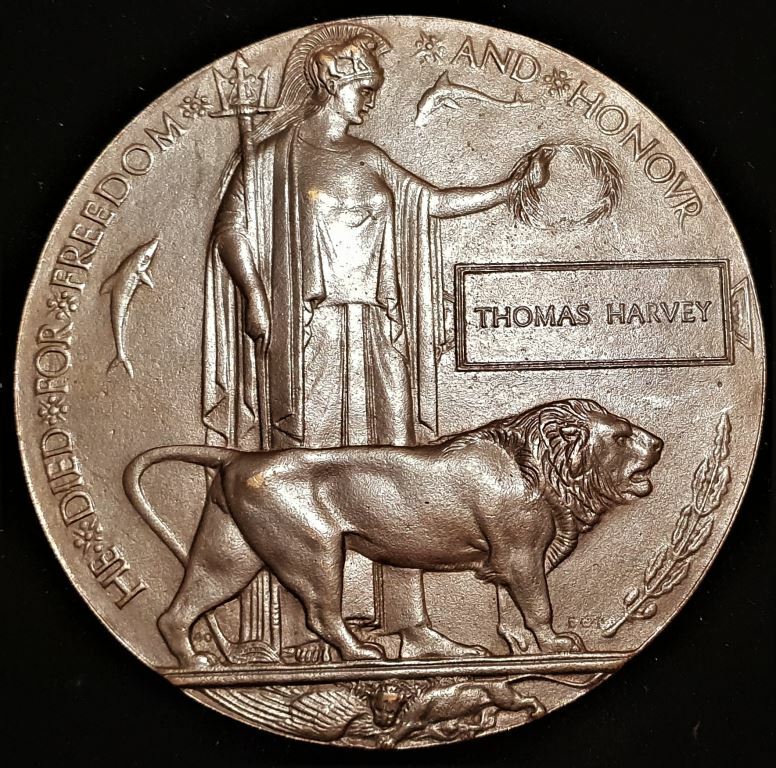 4362 Pte Thomas Harvey embarked on the 7th December 1915 from Sydney with the 3rd Battalion AIF. Memorial Plaque: Correct one piece cast named to WILLIAM HENRY PERKINS. 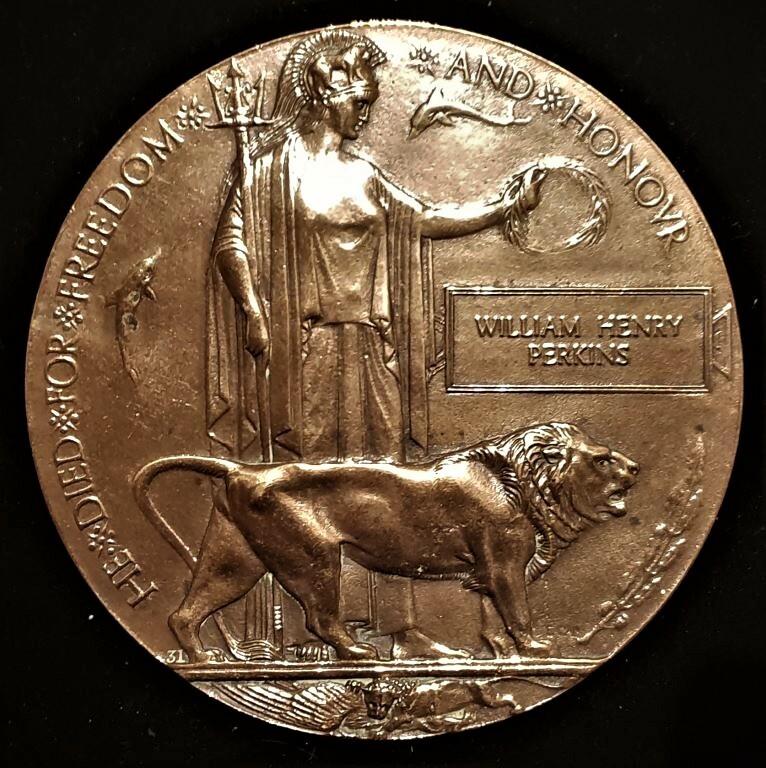 2971B Pte William Henry Perkins embarked on the 25th October 1916 from Sydney with the 55th Battalion AIF. Memorial Plaque: Correct one piece cast named to THOMAS CLARKE. 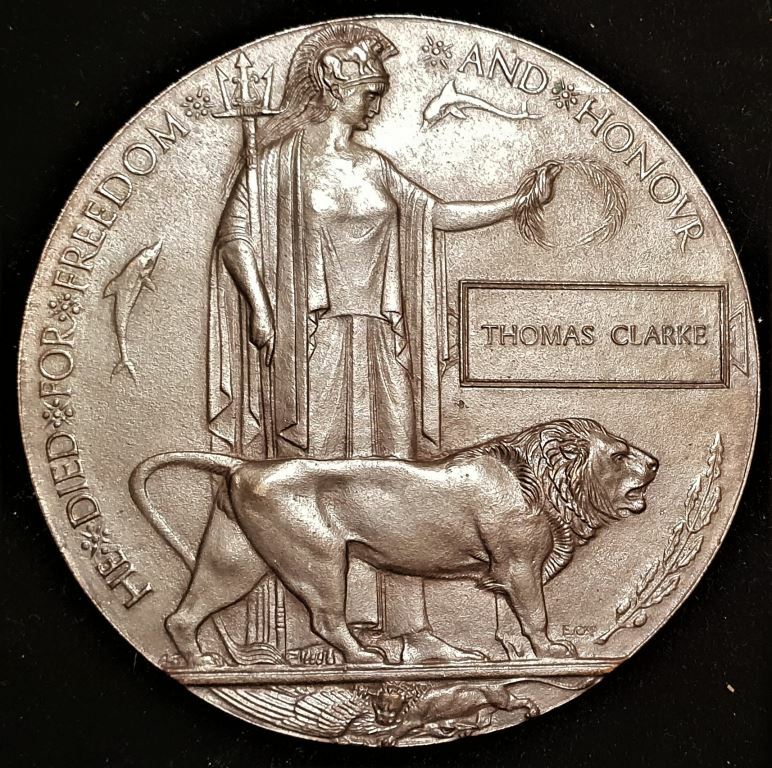 2041 Pte Thomas Clarke embarked on the 16th August 1914 from Thursday Island with the 41st Battalion AIF. Memorial Plaque: Correct one piece cast named to RICHARD DOWNES. 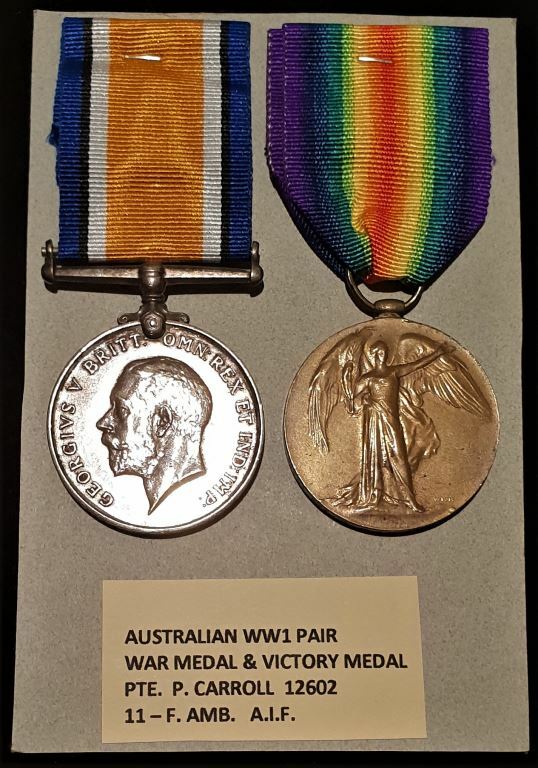 Commemorated at Thiepval Memorial Somme, France Pier and Face 12 A and 12 D.
Note: Comes with photo with “Downes” written on the back of an Australian soldier, possibly relative? 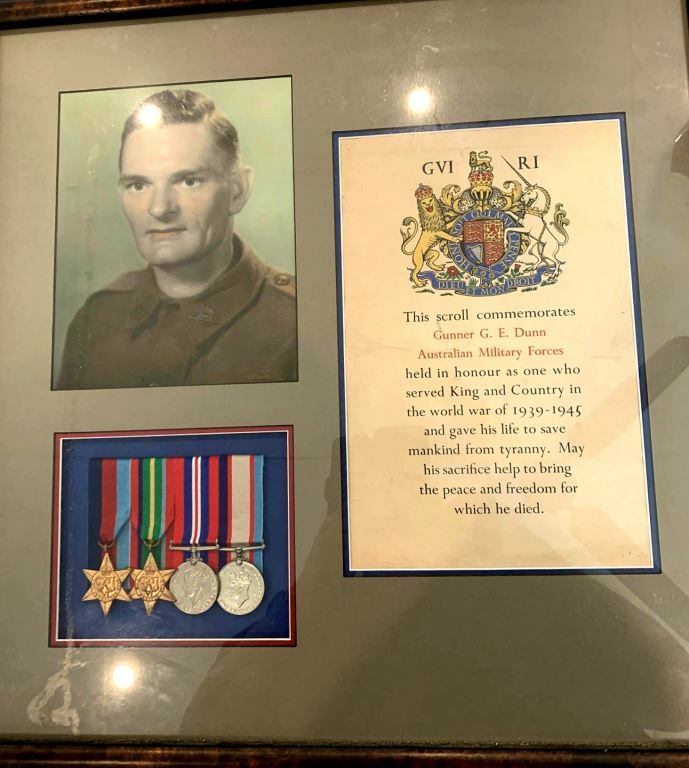 Initially assigned to the 2nd Field Regiment before embarking in Cairns for Milne Bay and operations in New Guinea on the 14th August 1943 per ‘Howell Cobb’ and then 2/4th Light Anti-Aircraft Regiment on arrival. Buried Finschhafen, map reference 269226 and then reburied Lae War Cemetery, Lae, Morobe Province, Papua New Guinea Plot EE, Row C, Grave 2 Headstone inscription reads duty nobly done. He was 32 years old. Son of Edward Henry and Gertrude Grace Dunn, of North Richmond, Victoria. EE.C.2. “The Battle of Finschhafen was part of the Huon Peninsula campaign during WW2 and was fought between Australian and Japanese forces. The fighting took place between 22 September and 24 October 1943 following the landing at Scarlet Beach, which was followed by a two-pronged advance on Finschhafen as the Australian 20th Infantry Brigade advanced on the town from the north, while the 22nd Infantry Battalion drove from the south, having advanced from the landing beaches east of Lae. After the capture of Finschhafen, the Japanese forces in the area withdrew towards Sattelberg where they sought to hold the Australians before launching a counteroffensive, which subsequently threatened the landing beach. This attack was repelled by American and Australian forces, with heavy casualties being inflicted on the Japanese. In the aftermath, the Australians went on the offensive, capturing Sattelberg, and then advancing towards the Wareo plateau”. 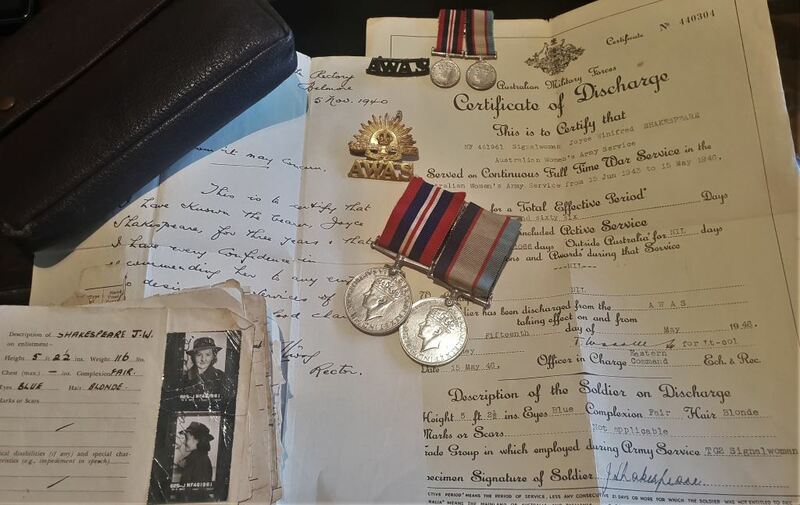 Enlisted 3rd July 1940 into the Australian Army at Caulfield, Victoria. Previous service listed in WW1 from Tasmania but did not make it overseas with cease of hostilities. 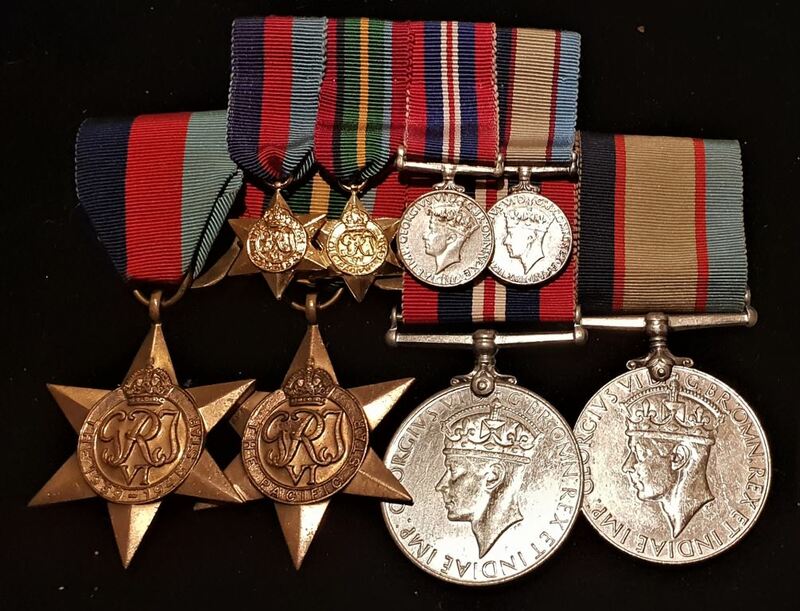 Note: Medals come with Bible, Tobruk Seige medal, engraved “W. 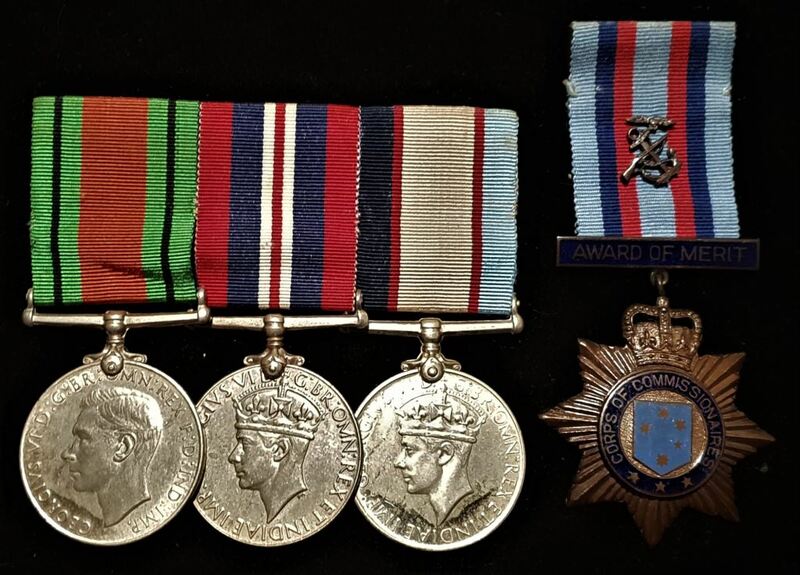 Shaw VX42588”, miniatures, ribbon bar and RSL badge. 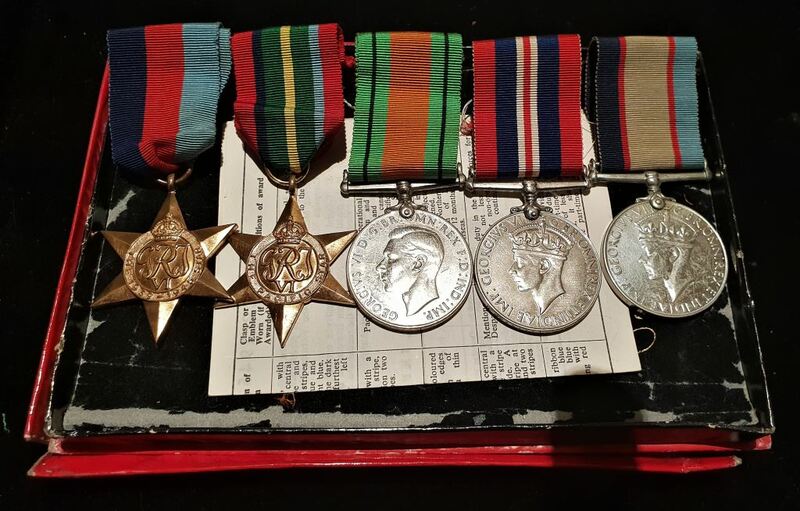 At the time of listing these medals, Private Hetherington-Harford’s service records were still sealed. The following was taken from the WW2 nominal roll. 22nd April, 1941. Tobruk, Libya. The Benghazi Handicap's Wooden Spooners. Meet two of the 9th Division's luckiest men. QX1698 Sapper Stanley Curtis and QX2454 Sapper Edward Hetherington-Harford of the 2/7th Field Company, Royal Australian Engineers enjoy a well received cigarette after their late arrival in Tobruk on foot after a 16 day trek. Left behind in Benghazi to plant demolitions on Italian supply dumps so that the advancing Afrika Korps could not take advantage of them the two Sappers planted explosives to cover the 9th Divisions retreat, known as "the Benghazi Handicap". When surprised by the rapid approach of the advancing Afrika Korp the two men hid and were overtaken by Rommel's Panzer Divisions. Finding themselves behind enemy lines and surrounded by thousands of Axis troops the men hid by day and travelled by night where possible overland on foot. After a journey of 16 days, and 300 miles (483 kilometres), the men managed to sneak past German positions surrounding Tobruk and return to their units. Immediately hospitalised for treatment of their injuries it is not known if the men played any further part in the Western Desert Campaign. If so I believe they well deserved any rest coming to them after that. 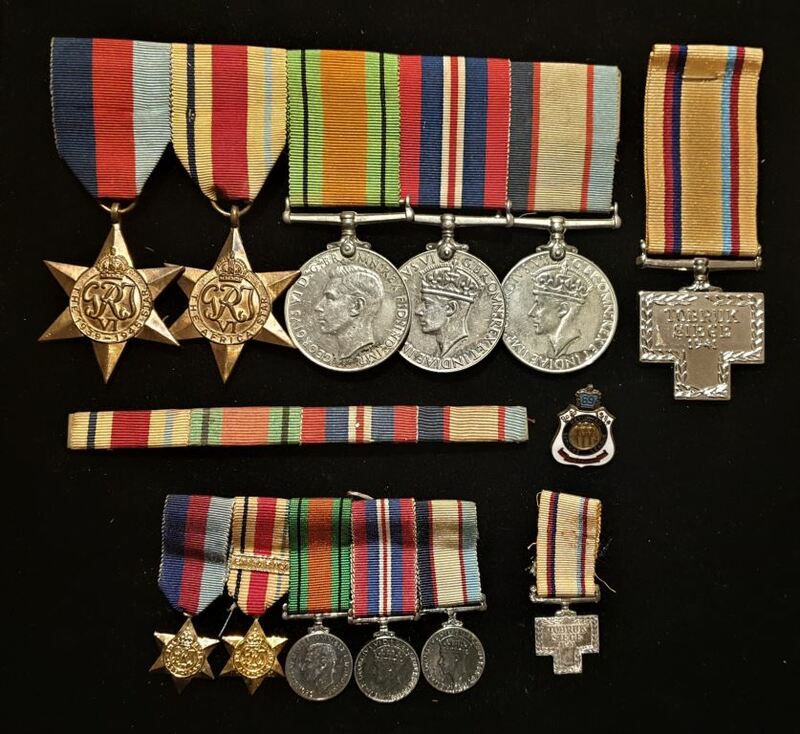 At the time of listing these medals, Driver Gibson’s service records were still sealed. 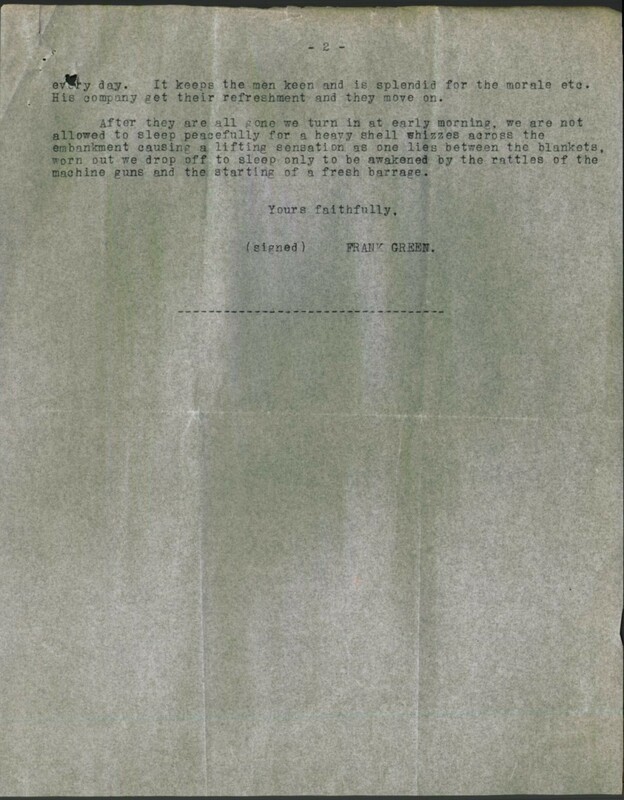 The following was taken from the WW2 nominal roll along with photo and research from 2/30th Association website. 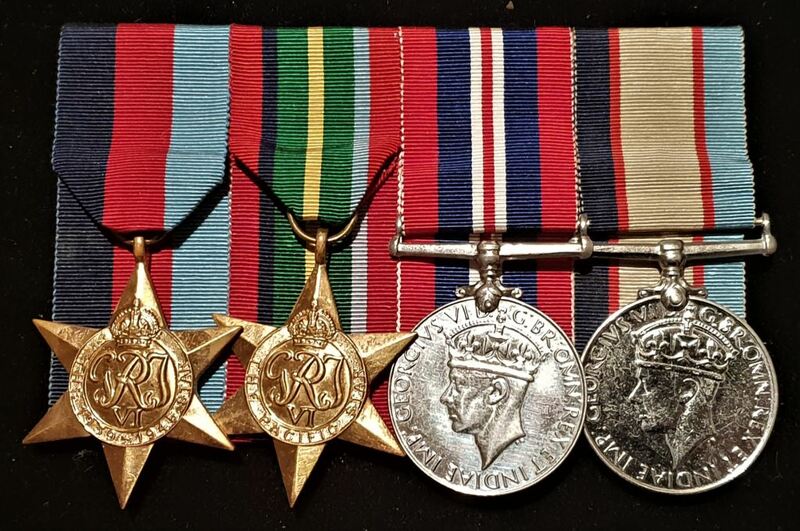 At the time of listing these medals, Warrant Officer Class 1 Suttie’s service records were still sealed. The following was taken from the WW2 nominal roll. Note: Comes with box of issue. 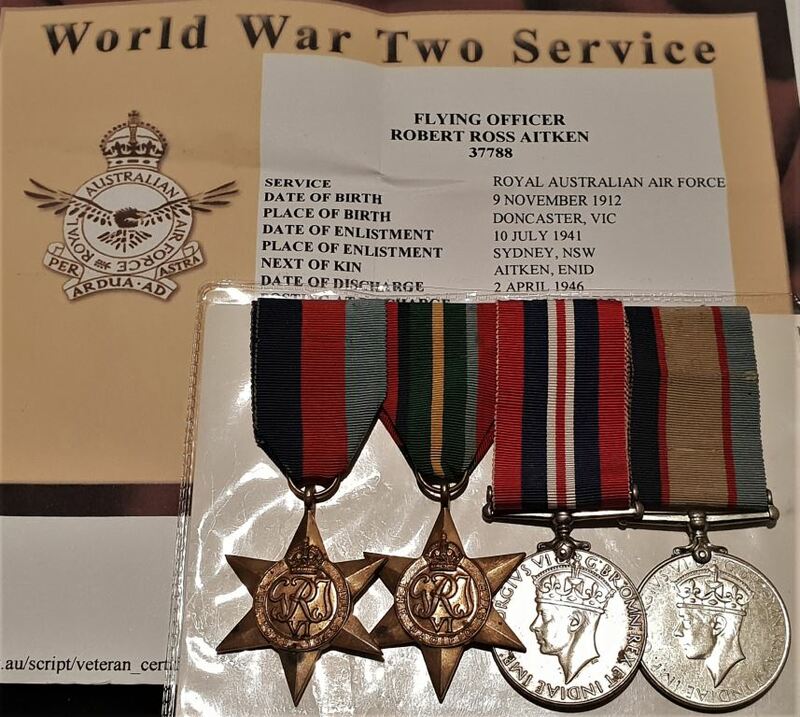 Note: Comes with a lot of original paperwork (including service photo), miniatures and several AWAS badges.